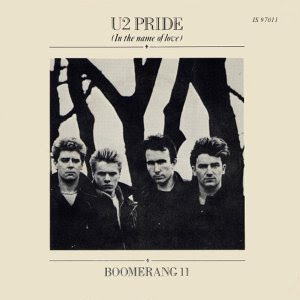 "Pride (In The Name Of Love)" lyrics U2 - live version from Denver, USA. Pride was originally on The Unforgettable Fire Album. Chrissie Hynde of The Pretenders sang backing vocals on Pride. As she was married to Jim Kerr of Simple Minds at the time, she is credited as "Christine Kerr". Pride's lyrical theme was originally intended to be about US President Ronald Reagan's pride in America's military power but Bono was ultimately influenced by Stephen B. Oates's book Let The Trumpet Sound: A Life of Martin Luther King, Jr. and a biography of Malcolm X. These readings caused Bono to ponder the different sides of the civil rights campaigns, the violent and the non-violent and so several of the songs on The Unforgettable Fire reflected these lyrical themes - E.g. MLK. Check out the lyrics to the recently 'rediscovered' Disappearing Act.